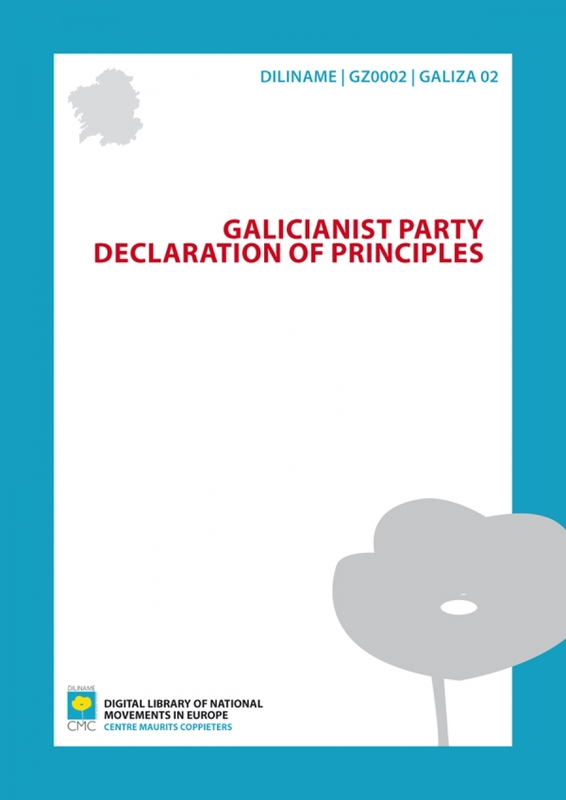 The political and ideological programme of the recently founded Partido Galeguista (Galicianist Party), proclaiming Galicia’s right to self-government and demanding a Statute of Autonomy. In December 1931 the Partido Galeguista de Pontevedra (Galicianist Party of Pontevedra), directed by Castelao and Alexandre Bóveda, called for a General Nationalist Assembly in order to create an all-Galician nationalist party. A total of 32 Galicianist organizations attended. Galicia, cultural unit.- Confirmation of Galician personality characteristics: language, art, spirit. Galicia, an autonomous people.- Political self-government of Galicia within the Republican government. Galicia, cooperative community.- The land for Work; work for the Land. Galicia, the cell of universality.- Anti-imperialism, federalism, international federalism, pacifism. Creation of a Galician body whose basis is exclusively democratic with a governing capacity to rule Galician interests with integral autonomy. A minimum and immediate goal, would be to confer the maximum power the Republican Constitution gives to autonomous territories, to that organisation. Ensuing the abolition of Provincial Councils. Complete municipal autonomy, recognising the administrative nature of rural parishes and of the region, with the right to govern with their own specific interests. Incorporation of neighbouring territories to Galicia, which have ethnic, historic and linguistic links to it, as long as this is always determined by referendum. Full political rights for civil servants. Removal of powers for those who can be elected for political posts, but do not provide a useful service to the community. Study of a formula that shall allow emigrants to have direct representation in Galician political organisation. Proportional representation, in large constituencies, to elect the Galician Council. Direct democracy to be practised in Galician political organization institutions - referendum, recall, open council. Adoption of efficient procedures to avoid electoral corruption and the faking popular will. Jurisdictional control on the Galician organisation's and council's administrative and fiscal activities. The administration shall have economic responsibility for damages their agents may cause whilst carrying out their public duties. Applying international working regulations in Galicia. Integral regime for social security, provision and fair family participation in work profits. Eliminating minors under 16 from industrial work and regulating and monitoring their family work, making it compatible with their moral and physical education. Training centres and the income that maintains them should be quantified by the Galician government. Creation of schools for professional orientation. Creation of technical agricultural, forestry and livestock investigation and experimentation centres, with sections dedicated to cooperative organisation, communication and direct teaching. Stations for animal selection and feeding trials. Veterinary school. Legislative measures that favour cooperative organisation and syndication helping in improvement measures and agricultural and livestock selection and for the development of agricultural credit. Galician heritage forestry repopulation Intensive repopulation of communal forests by the Galician organisation and creation and development of pasture areas Forceful syndication to repopulate forests under private ownership. Protection of the timber industry. Forestry insurance. Legislative and economic measures to increase electrification in rural areas. Regulation of rural building taking into account sanitation and according to country techniques and local uses. Tenders to boost the study and promotion of plans for model buildings. Economic incentives to carry them out. Free import of corn, not only for people to consume but also for a more balanced feed for livestock if they so wish. Rural schools for farm training that will raise the village people's status, developing a community spirit, instilling affection for the native land and establishing an ample base of technical and agrarian culture. Regulation of rural property tending to free it from all charges for those who work on it: a) Tenancies.- Limitation of property rights on tenanted land for land workers, and encouraging their release: right to retraction, economic aid, participation in improvements. b) Forums - Ending the rural problem through forceful rent termination without it being at the cost of the small rural landowner. c) Land consolidation. -Regulations that will impede excessive land fragmentation when the property is passed on. d) Real credit - Implementation of the Torrens system for the named property's mobilisation, registry and insurance. Cooperative agricultural bank. To consider land as a work tool for small landowners: declaration that they be exempt from rural taxes, if they can prove that they have no other means of income but from their manual work. Not allowing the seizure of their assets in the same conditions. To consider buildings and rural houses as land accessories that its inhabitants cultivate and the abolition of the urban taxes that they pay. Return to traditional community principles of the Galician fishing economic regime, through a specific fishing cooperative with a technical and social direction. Creation of fish farms to repopulate Galician rivers. Repopulation of the “ rias” with established species, industrialising their use. Tax reduction for raw materials in the fishing and canning industries. Creation of large modern fishing ports and small refuge harbours. Protection of new industries dedicated to large scale fishing. Fishing schools. Coastal laboratory. Meteorological and radio operation stations. Demarcation of the State's fiscal regime from the autonomous government and from the councils. Elimination of 20% of private equity and 10% of forestry uses and all municipal budget appropriations that have services not involved with councils or their commonwealths. Elimination of the personal card tax and creation of an identity card that will replace it. Creation of a progressive tax on income. Right to expropriation in favour of the Galician organisation in cases of fraudulent concealment. Galician sovereignty to determine their educational institutions direction. Indisputable right to use our language and for it to be jointly official with Castilian Spanish. Recognition of Galician civil right terms: family law, inheritance rights, etc., etc. Equal married women's rights or at least in the case where the husband has emigrated. The duties of the courts of justice shall be to act as the last resort in Galicia in cases of applying Galician legislature. Extending expropriation rights to make possible the socialisation of natural resources and economic companies, and extension of municipal public services. 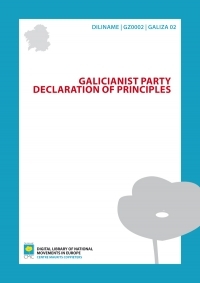 Galicianist Party (Partido Galeguista) was the galician nationalist party founded in 1931. Political forces and people who defend galicianism are called galicianist. Galicianism –a concept emerged with the apparition of modern Galician nationalism– is a political ideology of nationalist character whose objective is the defence of Galicia and its culture by the means of the establishment and strengthening of its own institutions.